From the John Hardy Classic Chain Men's Collection. From the John Hardy Classic Chain collection. Embossed leather bracelet. Sterling silver. Signature woven chain station. Magnetic clasp. Approx. 8.2"L; 7.5" inner circumference. Handcrafted in Bali. 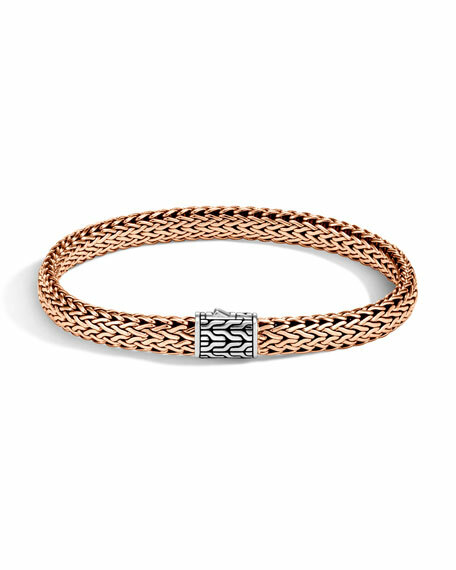 John Hardy men's sterling silver bracelet from the Classic Chain collection. Chain-engraved center ring detail. Large flat chain band. Lobster clasp. Handcrafted in Bali.